From Spaetzle to Samosas: Easy Pizza Dough! We like to make our own dough when I have time. It's ridiculously easy! Place 2 tablespoons of flour in a small bowl. Add sugar and yeast and about a half cup hot/warm water. Mix well and place in a warm spot. When the mixture has doubled in size and become bubbly add the starter mixture to the rest of the flour. Add olive oil, salt and more water as needed and knead into a nice, elastic, dough. If it's too stiff you'll have trouble keeping it from retracting later. The ideal dough is not stiff and not too sticky. Add more flour if too sticky and more water if too stiff. Knead for about 5 -7 minutes. It's therapeutic. Now pour a bit of olive oil into a good size bowl and put your ball of dough into it. Since you want the dough to double in size make sure the bowl will easily accommodate the growth. Swish to distribute the oil. Cover the bowl with cling wrap or a damp towel and place the dough in a warm, draft free place until doubled in place. I like the oven. I turn it on at 170 degrees (my lowest setting) and once warm turn it off. I open the door for a moment so it can cool a bit more and then pop the bowl with the dough in there and close the door. Voila. Once the dough has nicely doubled punch it down and divide into two. Hand stretch each piece into a nice piece of pizza base. I make mine rectangular as you can see. Let rest for 10-15 mins in a warm place. If you like your pizza crust crunchy by-pass this step. Now comes the fun part. Toppings. I like to use Contadina's pizza sauce in their squirt bottle. It keeps well in the fridge. Apply a base of sauce. Some like it saucy. Some don't. We like it on the lean side. The kids like their pizza simple. Just add sauce, cheese and pepperoni. I like mine with tons of veggies and no meat or pepperoni. I also like to use minimal cheese on the bottom (just enough to hold the veggies in place and instead use some left over Brie (I live for that stuff) on top. Sprinkle with Italian herbs and pop in the oven at 370F. Bake until cheese is bubbly and starting to brown. Now, if you use lots of toppings you may need to keep it in the oven longer than if you make a basic cheese and pepperoni version. The nice thing here is the flexibility. Use up old marinara or spaghetti sauce and veggies. I've even added left over steak from a steakhouse on the pizzas. Be creative. 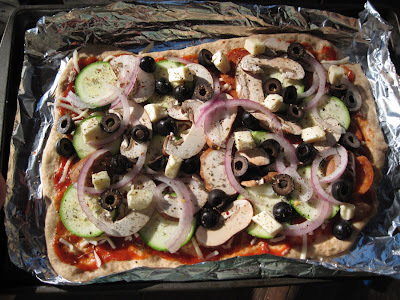 Click on the pictures to see a larger version of my pizzas. Then drool. 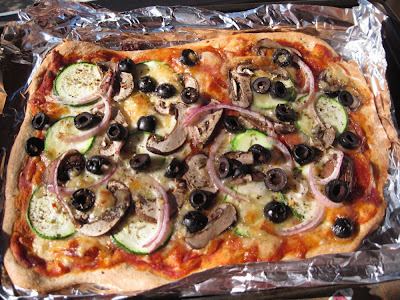 My raw uncooked pizza featuring zucchini, mushrooms, onions, olives and brie. Once cooked this pizza practically begs you to devour it at record speed. This looks fantastic, I can almost smell the goodness! Excellent blog, I love the precision of the recipes and the expert advice.